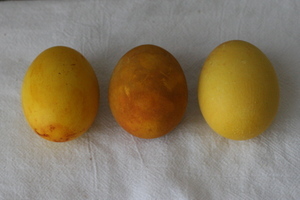 for the last six years i've been dyeing my eggs with vegetables and spices. i continue to love the process and the results. aren't those colors amazing? totally worth the combined stink of boiled cabbage, turmeric and beets looming in my apartment for a day or so. . . and apparently filling the hallways of our building, based on the amount of air freshener that a neighbor sprayed outside my door yesterday. sorry neighbors. i'm just here to spread easter cheer. 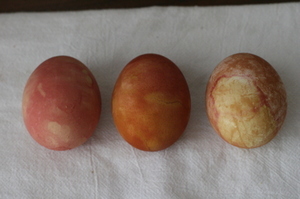 there are two ways to dye your eggs. the first is boiling/simmering your eggs in the dye. this generally results in really saturated, even colors for 30 minutes. the second is "cold-dipping" them in strained very warm to room temperature dye, anywhere from 5 seconds to hours depending on the desired color. 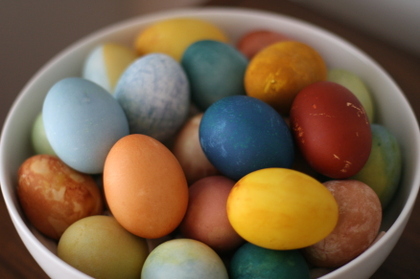 this results in more translucence and subtlety and also requires regular rotation of the eggs if you want even coloring. the general ratio for making the dye is 1 cup of vegetable (chopped if necessary) to 1 cup of water. for turmeric, add 3Tbs to every quart of water. bring to a boil and simmer for 30 minutes. add about 2tsp (i never measure) vinegar in the dye after about 20 minutes. this is what can result- with a billion variations in between. onion skins. 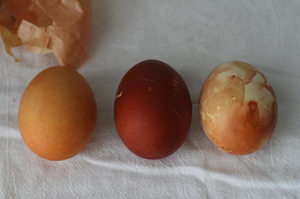 (from left to right) first egg cold-dipped for about 30 minutes. second boiled in dye for 30 minutes. third rubbed with vinegar, wrapped in onion skins (while raw) then wrapped and tied in cheesecloth and boiled for 30 minutes. i love the marbling. the colors that come just from onion skins always surprise me. red cabbage. first egg cold dipped in warm dye for 20 minutes. royal blue left in dye for an hour or so. marbly egg boiled with the cabbage leaves in the pot for 30 minutes. turmeric. middle egg boiled for 30 minutes. other two left in warm/hot dye for about 15 minutes. i had some lovely and subtle yellow shades that i had just cold dipped, but ended up dipping them into other colors. turmeric and cabbage. various combinations, various lengths. since these two dyes are the quickest and most obvious, i played a lot with them last night as i was teaching some ladies at church the glory of natural dyeing. beets. first cold dipped for about two hours. second boiled in beet dye for about 40 minutes. third cold dipped for about an hour. beets are always a little disappointing, but i like having some sort of pink-ish in the mix. coffee. first time using coffee and probably my last. i was hoping for a really dark brown but ended up with this after nearly an hour of simmering and another hour sitting in the dye. the lighter was about 40 minutes in the hot dye. perhaps the coffee i made was too weak? it looked really really dark to me but i have no idea what i'm doing with coffee. chip had to ask the editing studio he was working at that day for the stuff i used. . .
so now we have a lot of beautiful colors to look at, some dye i'm considering using for fabric and two dozen hard boiled eggs i'm hoping to find a use for. 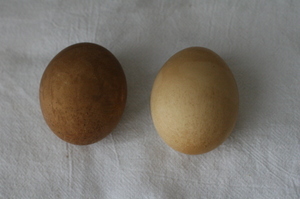 Those are gorgeous Katie.. and though I've known about natural egg dying (Martha did it years ago).. I've never worked up the energy to actually do it. But this post may have convinced me..
Now I'm feeling a little sheepish about the egg dying tablets I picked up at the store last week! ok, I am going to do this next year. 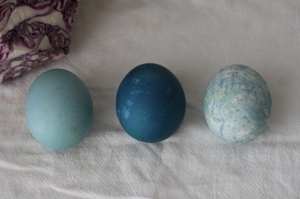 I have kinda burned out on the egg dying in the last couple of years. I felt that I lucked out that Chloe did it a preschool, and the other two won't be around to do it this year, sad way to be. I think this natural dying is so amazing, I never thought you could actually get colors that dark! And all the cool marbling, great job Kate. i'm thinking i need to give this a try as my one attempt with some cooking wines was unsuccessful. beautiful! 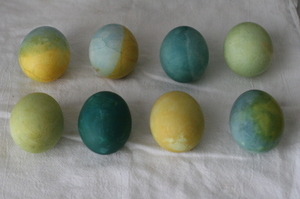 You have totally inspired me to naturally dye eggs this year. I have never tried it before. I was hoping to go to your night of instruction -- dang-it. I wish I had. These are beautiful. Maybe I can get Brian to humor me for an egg-dying evening tonight or tomorrow (with tablets, of course -- since I'm just a beginner). We'll see! gorgeous katie. little works of egg art. Wow! Gorgeous! I never knew you could dye eggs with natural ingredients like that! They're sooo beautiful. I'm tempted to try that tomorrow, but somehow methinks I'll end up with burnt onion skins and a pot full of watery coffee as I do not share your artistic talents in the least. Perhaps my sad little pink and green eggs will have to live vicariously through your blog. Happy Easter!!! ok, this sealed the deal... you're officially at the top the list of most amazing poeple i (sort of) know. i think i might have to try this! they're so unique-so much better than the unnatural colors the kids and i concoted tonight. by the way, tomorrow i'm making the red velvet cake you talked about recently; any tricks i should know about? have a wonderful easter!! Wow, these are really great colors, I'm gonna try this next year! well, probably not, but I really want to. Blue from onion skins? I'm confused but really fascinated. Really cool. Katie, I just love the eggs. Very old timey. I can't get enough of this type of thing; "real" or "original" ways to do things. Also that fairy party, I can't say enough about it. Ok, so you also wanted my blog, here it is. Eeek! Your eggs are Beautiful! I tried this. My beet/cabbage results were so lame, I didn't post pictures. NEXT year :). Thanks for the inspiration. amazing... oh, and the eggs too! These are gorgeous. My only hesitation is that half the fun of dying the eggs is getting to eat them. I assume that if you boil them in dye for 30 minutes, they become inedible. Would that be correct? Wow! This is so cool. I just came across your blog!! I too was wondering if you could eat the eggs after this natural dying? I must tell you and I havent said it before you are a genious and I love your style. These are amazing! I just tried turmeric myself for the first time, on various egg colors (my chickens lay both green and brown eggs) and loved it. The colors from the red cabbage though are incredible! It makes me want to drive the 25 miles to town just to buy a cabbage. That photo at the top is just gorgeous too. A little late for this year but: if you want to dye (works on almost any medium) a nice brown you should try black tea! I´m reading your blog lately while nursing and feel inspired by the projects you did for your kids. Thank you for keeping these posts up! Has anyone tried the other "old fashioned' dyes? Rhubarb? Blueberries? I think you are the original that doing that. I can't experienced that kind of dying. All I know is that dye can be used in clothes. Have you ever used avocado peel. It is a dull pink, kind of a mauve color.